There are a lot of toy drills for kids. The problem is, they are all toys. When your son or daughter has outgrown the pretend tool, it might be time to consider a real tool. A drill is a popular choice, but I recommend opting for an impact driver instead. No big chuck with big openings and rough textured ring – safer. Strength not needed for tightening a chuck. They use a quick connector. Bits snap in and out. It’s a tool that they can grow into, rather than a toy to be discarded. Often these tools come with no battery (known as “bare tool”) or they come with choices of the size (Ah) of the battery. I suggest going with smaller batteries like 1.5Ah or 2Ah as they are both lighter and smaller in size… they are also less expensive. Buying real impact driver, not only has the potential to build their skills, it also mean that in the event they lose interest, it can move to mom or dad’s workshop and get used. James Wright runs a great YouTube channel for handtool woodworking. Today he made great video about building a tool tote with his young daughter Melody. I love that he lets her do most of the work with minimal assistance. I wish he’d get some small safety glasses on her though. Kids are precious, so are their eyes. Melody also posted her own version of the build. Big smiles all around. This comical video about getting kids into the workshop has a lot of sarcasm and comedy and is targeted at the adults, it has some great advice too. Let it bring a smile to your face, then get your kids out into the shop with you. In this video, a Dad walks his son through building throwing arrows (large lawn darts). It is nice to see examples of good teachable moments. What is also nice about this video is that he shows both advanced and simple ways to do things. Example: Use a band saw to make the slots for the fins, or use a Pull Saw to do it. The only thing that makes me cringe is that neither the dad nor the son ever have a pair of safety glasses on. Safety habits are learned early. Monkey see, monkey do and all that. These toy tool kits for kids by Green Toys seem to tick all the boxes that make them a perfect set of toy tools. Gender friendly colors – Blue Tools, Pink Tools. These toys seem well made and with good intentions. 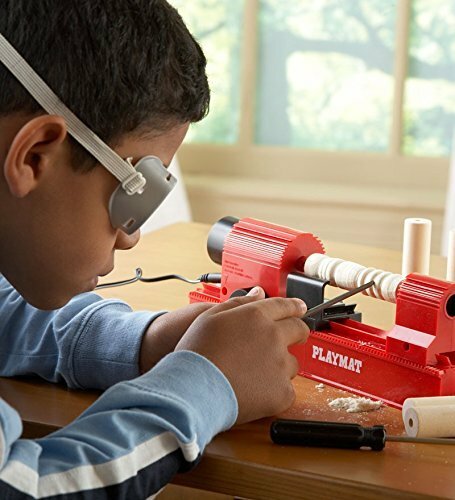 Great for modeling what Mom or Dad are doing in the workshop. Child working on the lathe. Overall for a little tool, it is quiet and safe. My son has enjoyed shaping the wood dowel segments on the lathe. And cutting and sanding the thin sheets of plywood included in the kit. The plan-book that it comes with is quite well thought out. Though most of the PlayMat is plastic, it is quite strong and seems to be holding up well so far. This kid-friendly project is perfect for tablet wielding kids. It is simple and doesn’t require much shop time but covers some basic skills. Safety habits start early. Unfortunately the googles that spend the whole time face down on the workbench aren’t protecting anyone. Part of workshop time is learning skills, and part, I’m afraid, is a bit like dress-up. Kids like to imitate us. They like to do what we are doing and wear what we are wearing. Of course, my tool belt even partially loaded will not fit my child’s waist. It immediately falls down. He wants to wear it so badly that he ends up holding it up with both hands. After a few minutes it becomes a safety concern. One I fear for his safety as he has no free hands to protect himself, and two I fear for my tools that keep falling to the floor on a toolbelt that won’t stay up. There are a bunch of toy tool belts but I prefer one of these which are a bit more serious. Cute video of a child identifying common bench planes. Now get your kids out in the shop and make something cute. I Love My Sawbenches, Mostly – Another take on grownups building saw benches that serve double duty as kid workbenches. Doug Stowe is a hero of mine who is a champion for getting young kids to build things with wood. His blog (wisdomofhands.blogspot.com) is a wonderful collection of thoughts on education and the need for kids to make things with their hands. He has a set of plans for making a child friendly bench hook for helping to do three things. Helping them saw more accurately. – Accurate cuts make better looking and performing projects. Success builds pride and confidence. Helping them saw more effortlessly. – Builds the enjoyment. Helping to keep hands safe. Sometimes trying to think of plans and methods while you are in the workshop with your child, it is easy to lose focus and make mistakes. 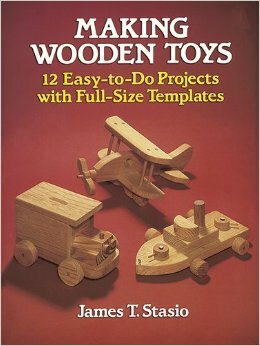 This is where a collection of plans for simple toys can be a real help. Here is a collection of 12 simple projects that both easily accomplished, but also quite a bit of fun to play with when they are completed. I am a fan of getting kids real tools (when safety allows) and I am also a proponent of getting kids toy tools. I keep the real tools in the shop for them to use when in the shop, and the toy tools in the house so they can play and pretend without fear of ruining the furniture. As an interesting twist to the imagination, a toy workshop model. 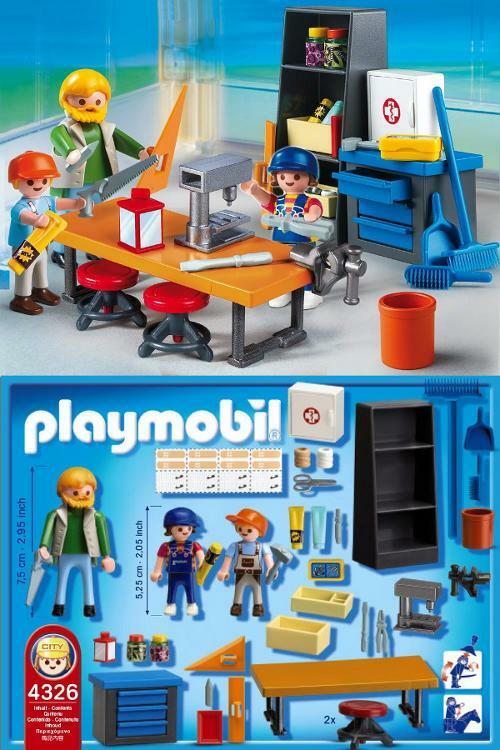 Playmobile has a woodshop that as far as I can tell goes along with a “school” series. However there is nothing in the set that would prevent it from being a pretend, home workshop. 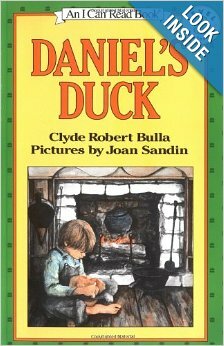 Daniel’s Duck is an enjoyable little story (Level 3 : grades 2-4) book that has a subtopic of woodcarving. It is not a carving how-to but centers more around the idea of art, and that what one person sees as ‘funny’ another sees as wonderful. It is a wonderful look at life in the early 1800’s but the real story about Daniel and his feelings about his creation are appropriate for all kids and timeless. 64 pages with color illustrations.